A watercolour of Newgrange by Gabriel Beranger, 1775. Newgrange is the best known ancient monument and neolithic chamber in Ireland. Along with the two massive mounds Knowth and Dowth, the great cairn of Newgrange stands on a low ridge over-looking the River Boyne 8 km east of the mouth of the Boyne. Pre-excavation: Newgrange in the 1930's. Newgrange is a massive cairn, a mighty collection of water-rolled stones, some 90 meter diameter contained a ring of 97 huge kerbstones around the base. 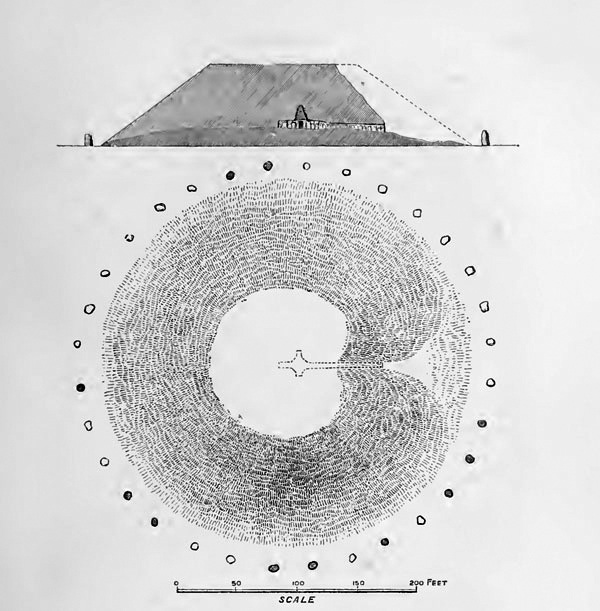 The mound is roughly heart shaped and probably was originally built in the form of a truncated cone—much like Maeve's Cairn, Dowth and Heapstown are shown in old illustrations. William Wakeman's plan and section of Newgrange, around 1880. The remains of a later bronze age period: great circle of standing stones surrounds the neolithic cairn. 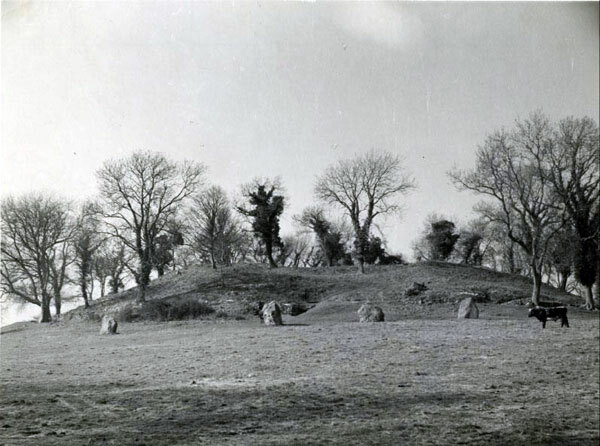 It is estimated that if the circle was ever complete there may have been up to 36 stones. Twelve remain today, and there is some doubt as to whether the circle was complete as not all the sockets have been discovered. Some have been proved to have been damaged by fire. Four smaller satellite mounds, two to the east and two to the west flanked Newgrange; one is buried today, the chambers of two, Sites K and L can be seen in the field to the west of Newgrange, and the remains of Site Z lie just east of the cairn within the Newgrange enclosure. The missing kerbstones of Site Z have been replaced with concrete pillars. Some of the decorated stones from Site Z can be seen in the Passage Grave display in the National Museum in Dublin. Newgrange from the air; an old Bord Failte postcard. Outside the entrance to the great mound there was a 'setting', discovered during O'Kelly's excavation, and also the remains of what may have been a hut site. In the same compound as Newgrange, and encircling Site Z is the remains of a huge timber henge, approximately the same diameter as the big mound, about 90 meters. Some of the post holes from the henge have been marked with concrete stumps. A very old plan of Newgrange dated to 1699. A plan of Newgrange showing how the three decorated stones relate to each other and the chamber. 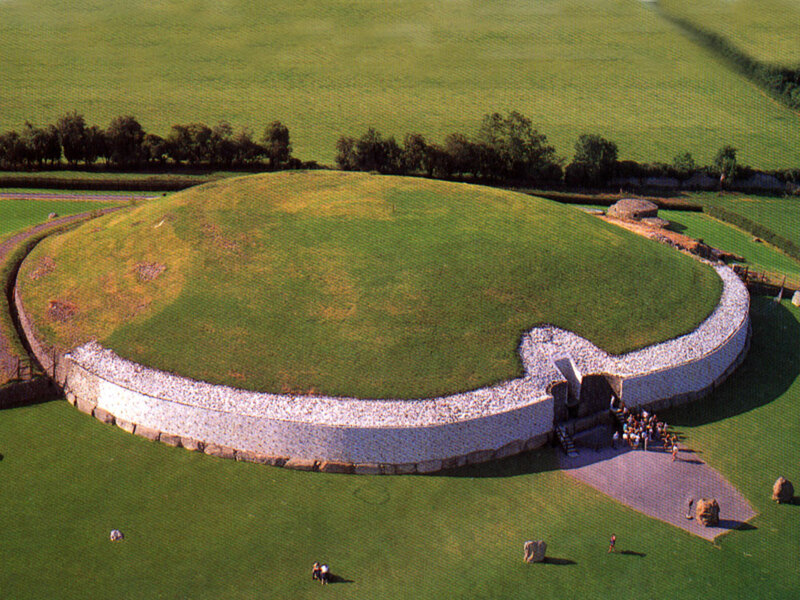 The chamber of Newgrange is engineered to allow the light of the full moons at midsummer to enter the interior. Newgrange was re-discovered in 1699 when the local landlord, Charles Campbell set his workers removing stones from a convienient mound on his land. By good fortune they began their excavation on the south west side and uncovered an engraved stone - the lintel of the roofbox. Soon they had uncovered the entrance stone, and for the first time since the Viking raids of the Nineth Century people entered the chamber of Newgrange. 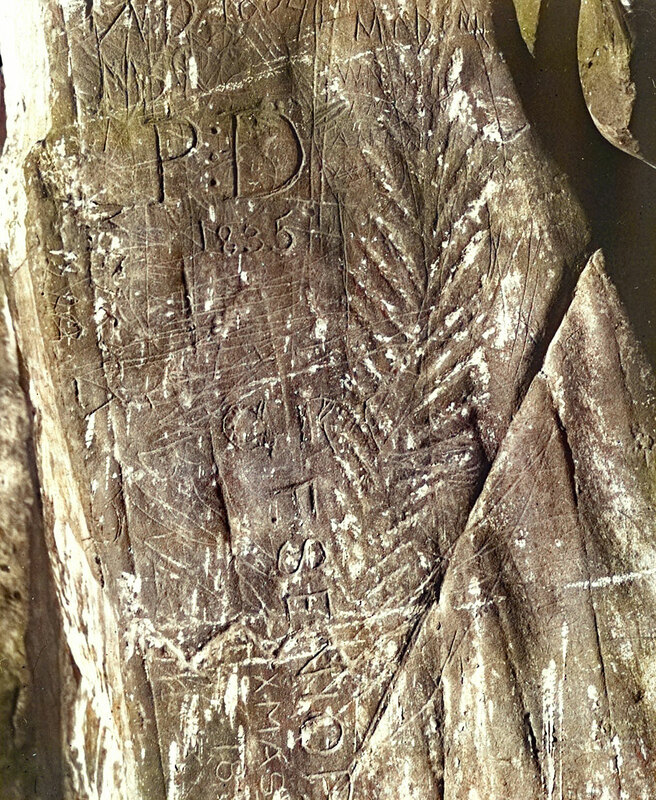 Graffiti within the chamber of Newgrange covers the 'fern' pattern on the edge slab of the left recess. The great mound quickly became famous and was visited by many of the early antiquarians. The first was Welsh polymath Edward Lhwyd who was on hand when the mound was opened, and who surmised the mound was a pre-Roman monument of the native Irish. Lhwyd found a gold Roman coin on the summit of the mound, which indicates people were leaving offerings long after the mound was built. The chamber was dug over many times by visitors, many of whom etched their names into the ancient rocks. Newgrange from the River Boyne 1 kilometer away to the south. The large unopened mound in the foreground is Site B.